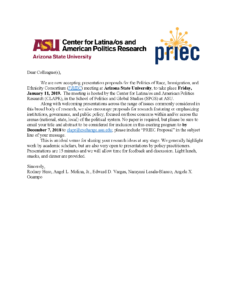 PRIEC is an ongoing series of meetings that brings together faculty and graduate students and showcases work-in-progress on racial/ethnic politics and the politics of immigration. The consortium’s main objectives are to provide a forum and a resource for graduate students seeking mentoring and advice, and for faculty to collaborate and receive feedback on ongoing projects. We welcome contributions from various perspectives, disciplines, and methods–with the only requirement that the work focus on politics (i.e. political behavior, political institutions, political processes, or public policy). We tend to have three or four meetings each year, mostly hosted by a college or university in Southern California. Since May 2009, PRIEC meetings have been held in other parts of the country, including UC-Berkeley, UW-Seattle, Stanford, Cornell University, University of New Mexico, UC-Davis, and Texas A&M. Click on the links above for more information on these meetings and other relevant announcements, as they become available. Finally, some kudos to some past hosts of PRIEC who have come up with some great poster designs, including Pitzer College, the University of New Mexico, Stanford University, and University of Oregon.